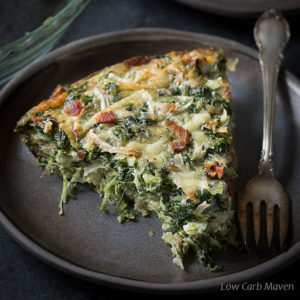 Here is another great low carb quiche to help use up left over ham. 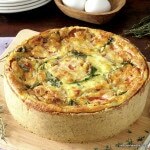 It can be made crustless for an every day breakfast quiche or with a crust for a more substantial meal. The crust gives it just the right look for a nice brunch and amps-up the flavor to spectacular. As long as we are talking about flavor, can we talk about the cheese for a minute? This low carb ham & arugula quiche has creamy Havarti cheese AND smoked Gouda. I like the combination because the Havarti cheese is a softer cheese and adds creaminess and the smoked Gouda adds a nice layer of flavor. Besides, who doesn’t like Gouda cheese? 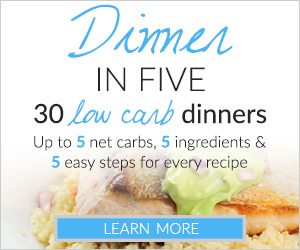 I’ve included the carb counts for those times one might want to make this a low carb crustless quiche. Crustless quiches are my favorite and this Ham & Arugula quiche tastes just as good crustless as it does with the crust. I’ve made quite a few test quiches and I have to report that they have all frozen beautifully. 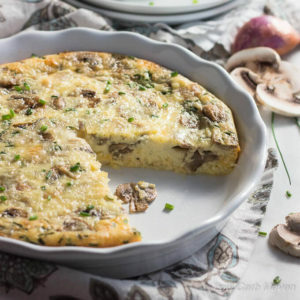 Remember, this is not a flaky pastry crust, it is a low carb quiche crust and it will be different – not bad, just different. Are you looking for another ham quiche? 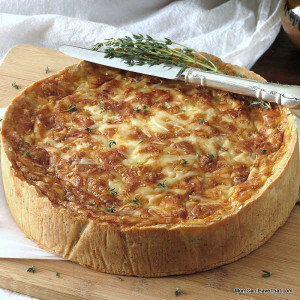 Try the Ham Quiche Lorraine with Caramelized Onions. 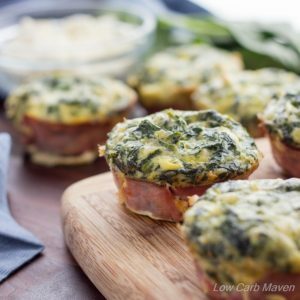 This great Low Carb Ham & Arugula Quiche is 6 net carbs per serving as shown. This beautiful Ham & Arugula Quiche is bursting with flavor and is suitable for a breakfast, a brunch or dinner. A nicely seasoned low carb, gluten & grain-free crust makes it extra special. Mix the dry crust ingredients in a smallish bowl and mix with a fork to combine and break up any lumps. In a smaller bowl, beat the egg, then add it to the dry ingredients mixing to form a dough. Refrigerate until needed up to 3 days. Thinly slice the onions and shallots. Cut the tomato in half and gently squeeze/scoop out the seeds. Slice thinly into rounds. Grate the cheese and reserve 1/4 to sprinkle on top of the quiche before it goes into the oven. Chop the ham. Preheat the oven to 350 and place the rack in the lower third. Add the onions an shallots to a cold pan with 1 tablespoon of oil. Turn the heat to medium-high and cook until the onions begin to sizzle. Stir to coat them in the oil. Add 1/2 cup water and simmer them, covered, until soft - the heat will need to be reduced during the simmering. When onions are soft, uncover and cook gently until they begin to brown. Add the arugula and cook until wilted. Remove to a large bowl. Add 1 tablespoon of oil to the pan and brown the ham, then add it to the onions and arugula. Cool slightly. Next, add the ingredients for the custard to the bowl, adding the cheese last. Blend together with a hand mixer and pour into the spring-form pan. Place the tomatoes on top in an attractive pattern and sprinkle with the reserved cheese. 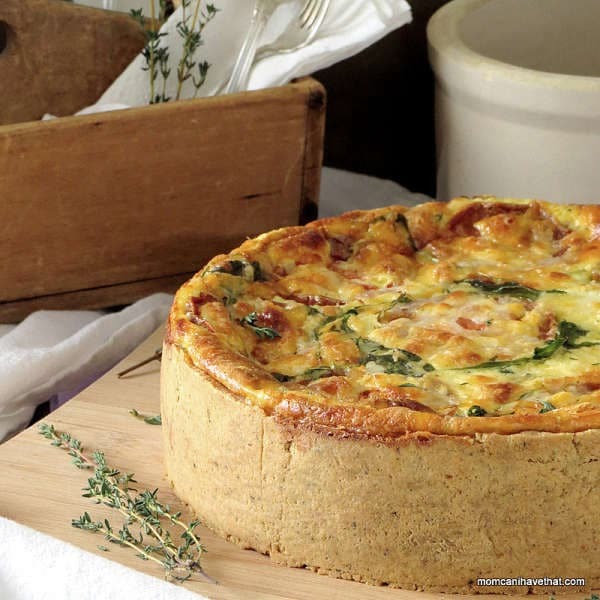 Place the ham & arugula quiche into the oven and bake for almost an hour. Remove from the oven when there is barely a wiggle in the middle for a properly cooked quiche. I prefer to wait until the top is nice and brown and the quiche is thoroughly cooked. When the quiche is done, remove it from the oven and cool for 30 minutes before removing the sides. Serves 10 as part of a brunch. I have extra ham leftover from New Year’s Day and would like to try this recipe, however I am allergic to nuts. I wonder if another gluten free flour can be substituted for the almond flour in the crust? This is hands down the best quiche I have a ever had or prepared. I used bacon instead of ham because that’s what I had and couldn’t resist after rendering the bacon grease. I am so happy to have found you and can’t wait to try your other recipes. Thank you! Had this today for Easter brunch. Really, really excellent flavor. I cooked the onions on low for a long time to where they were almost caramelized. Sauteed the ham on high pretty quickly so the peices got a nice browning. You may have mentioned this somewhere but FYI for folks, this makes two regular sized quiches. I made this tonight… WOW! It’s really great! The texture is so creamy and wonderful. Gouda and Havarti are two cheeses I never would have thought to put in a quiche or omelette, and I’m so glad I listened to you and didn’t go with Cheddar and/or Swiss. My crust didn’t turn out as pretty as yours, but it still tastes awesome – and I’m happy with the result as it was my first time using almond flour to make a pie crust. I made your loaded cauliflower last night and that was really good too. 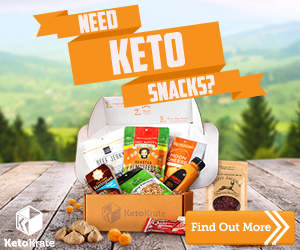 Love your website and can’t wait to try out additional recipes! This looks beautiful! What size springform pan did you use? You just put me way ahead on our planning for Easter brunch! Thinking some low carb chicken sausages, and a salad of greens with low carb fruit on the side…..and as a splurge, some champagne! Thanks for this recipe. It’s perfect! It looks great, but where does the arugula get added? I’ve read the recipe twice, and there’s no mention of it. Does it get sautéed with the onions and shallots? This looks like the quiche that is served at the B&B I visit in Key West, sad not going this year, definitely going to make this ! Thanks, Pernille. It’s my favorite! Enjoy. 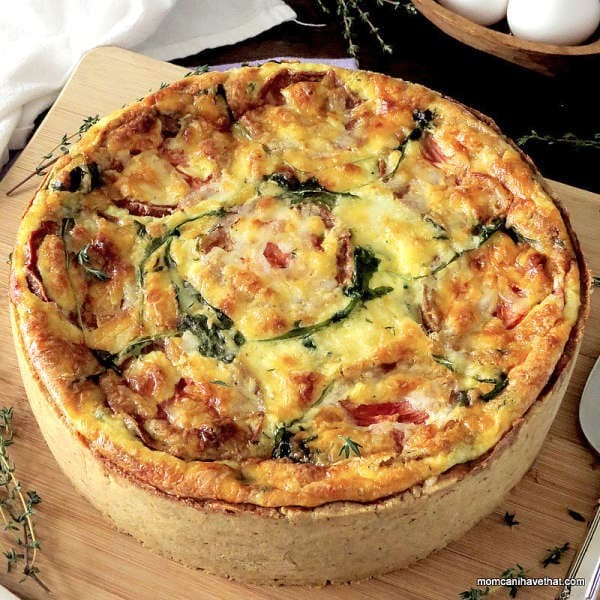 Kim, This quiche is not only beautiful, it also sounds seriously delicious! 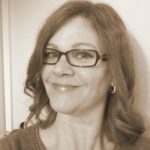 I LOVE gouda cheese… but really, what is there not to like about that cheese?? 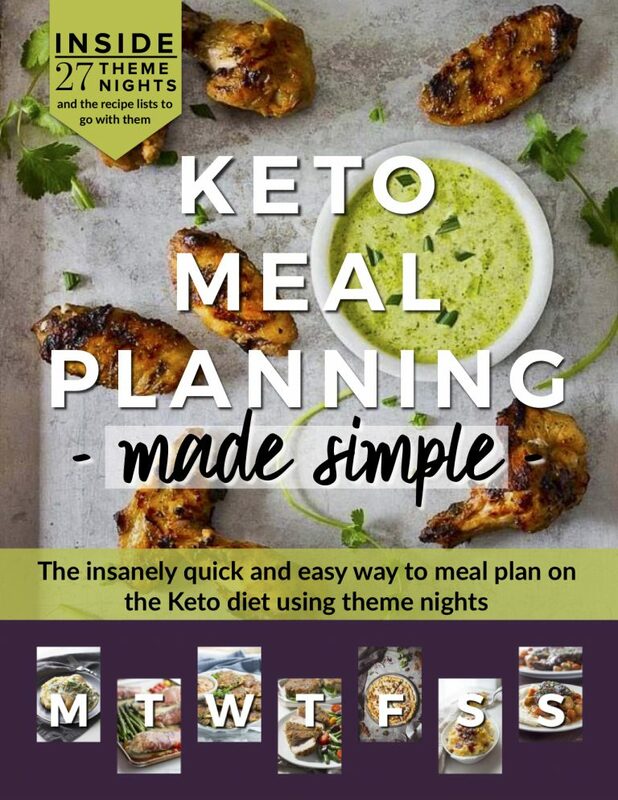 Thanks so much for sharing, I’m definately going to be making this soon! Cheers! Hi, Cheyanne. I’m glad you think so. I’m with you, cheese is a great thing. I hope you like it. Let me know either way! PS. I like your hat! This is an impressive looking quiche! I’d love to have a slice of this beauty!